In late July, 2003, Harman and I rode the Timber Chair to the top of Fernie Alpine Resort to walk into Lost Boys Pass which has a view of the west beyond the Lizard Range. As it was a blazing hot, we found shade and sketched the view towards the south from there. The day was memorable because there was smoke in the distance--wildfire smoke from Montana. Within days the backwoods in all of B.C. were closed and smokey from fires. This mosaic was made into a street banner which hung downtown for two years. 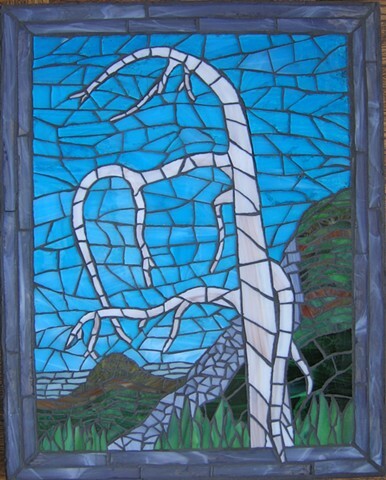 16"x24" There are two versions of this mosaic, the other one is available at the Fernie Arts Co-op.